Keratoconus is a progressive disorder in which the cornea gets thinner with time and this result in visual distortion. The vision quality deteriorates and this eye disease usually begins in the youth age affecting the industrious years of an individuals’ life. We at Aanya Eye Clinic, understand the importance of healthy eyesight and offering the best keratoconus treatment in Delhi. This is popular method for treatment of keratoconus. 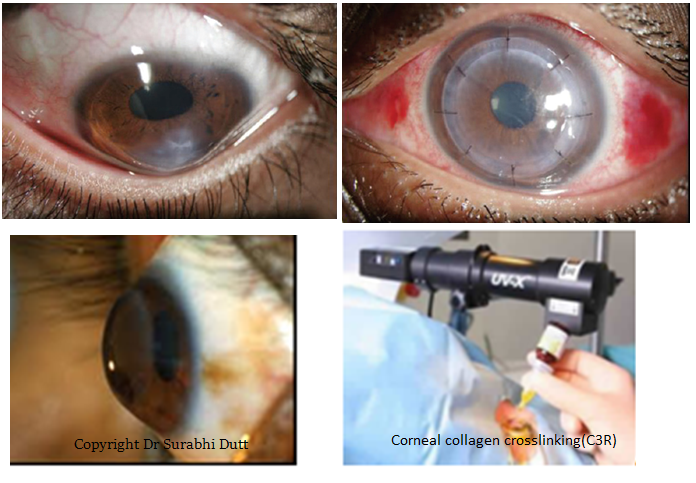 C3 – Corneal Collagen Crosslinking – as the name suggests in this procedure the collagen cross links of the cornea are strengthened. This is done by application of R – riboflavin eye drops. This riboflavin is activated by UV – A light illumination for 30 minutes resulting in collagen restructuring. This treatment is performed after numbing the eye with the application of tropical anaesthetic eye drops prior to the procedure. After the procedure, antibiotic eye drops are put in the eye. Thus the procedure takes about 1.5 hours for both the eyes. Usually, one eye is operated upon per sitting as after the treatment protective bandage contact lens are applied. These are removed in the follow up visit by the eye surgeon. The advantage of this procedure is that it arrests the cornea thinning or slows it down. Thus it is not a corrective remedy for the disease. But it prevents the disease from progressing & deteriorating and the need for cornea transplant. Also the vision deterioration is slowed or seized. Post procedure the glasses/ contact lens prescription is revised. It is a permanent procedure which does not require frequent follow up visits. In it no cut or surgery is done unlike INTACS or corneal transplant and thus there are no injections or stitches. There is no need of admission in this procedure and the recovery is quick. INTACS are surgically applied plastic polymer inserts which are crescent shaped which are placed into the cornea – this reshapes the cornea. This is used for treatment of keratoconus disease when the patients are unable to have clear functional vision with the help of glasses or contact lenses. This procedure is quite beneficial but if the keratoconus is still progressing, cornea transplant cannot be prevented. It is a day care procedure which usually requires 10 – 15 minutes. The procedure is done under local anaesthesia with tropical anaesthetic eye drops put in the eye. Also the eye surgeon may choose to administer an oral sedative. In this procedure outside the central optical zone a tunnel is created between the stromal cornea layers by the eye surgeon. The INTACS ring of appropriate thickness is then inserted in the tunnel. The vision is improved when the INTACS ring flatten the cone shaped structure of the cornea – making it more round like a normal cornea and improving the distorted vision. It is a very safe procedure with exceedingly good results in vision improvement eg – patients have been able to read two lines better in the eye chart. There are very few cases of patients reporting eye irritation. The first step is to obtain a consultation with an eye surgeon, who will advise you necessary tests to assess you for procedure suitability and the result in vision improvement from INTACS. It is necessary to have stable eye glass prescription to qualify for this procedure. Also it is best done post 18 years of age once the eye has fully developed.